We will be posting information about our practice and news about the wonderful people who are part of it. We hope you’ll come back from time to time to see what is new! California Optometrist of the Year - Dr. Dawn Miller! Dr. Miller works very hard to take great care of her patients. She truly cares about the health of your eyes as well as your general health and welfare. We use the most advanced testing instruments and best quality contact lenses and eyewear products available to ensure that you not only have the clearest vision possible, but are comfortable and look great too. Dr. Miller is pictured here with (left to right) Dr. Scott Daly, COA Awards Committee Chair, her husband Ray Schuler and her youngest son, Jace Pluemer. We are very proud to announce that the California Optometric Association also recognized that we have the best Optometrist in the state. She was just named the California Optometrist of the year! We couldn't agree more. In January of 2006, I resolved to quit smoking. Again. I had smoked for 32 years at that point. I had quit maybe 20 times by then, and after one or two and never more than three months, I would decide that I could have just one after dinner, or with a cocktail, or whatever and suddenly, I would be back to a pack a day. Even when my car was stolen when I decided to leave it running at a mini-mart in a questionable neighborhood while I ran in to pick up a pack of smokes, I still didn't quit. Then I met Dr. Dawn Miller at a Boys and Girls Clubs of America Volunteer Leadership Conference. She gave me additional reasons to quit, one of which was macular degeneration. Apparently, I valued my sight more than I valued my lungs or my life (or my car) and this was the final piece of the puzzle that convinced me to quit for real. What made it successful is that I finally admitted I was not tough enough, and never would be, to have just one. The only way that I would stay clear of cigarettes was to get through the initial months of withdrawal and then stay really and truly quit. It has been over 10 years since I quit, and oh, I got to marry Dr. Miller. She really is serious about saving the world one macula at a time. AFTER: Happy patient Ray after finally kicking his smoking habit of 30 plus years! 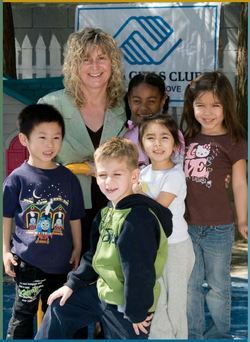 Dr. Miller is celebrating her 30th year of service on the Boys and Girls Clubs of Garden Grove Board of Directors The Boys and Girls Clubs of Garden Grove serves 6000 children per day with after-school programs and pre-school care and much more. It has nationally-recognized innovative programs for teens and truancy reduction, as well as a partnership with the Garden Grove police to operate a juvenile justice center counseling program to reduce recidivism for first time juvenile offenders. Its mission is to enable all young people, especially those who need us most, to reach their full potential as productive, caring, responsible citizens. Over the years, Dr. Miller and her fellow Board members have done a great deal to bring more programs and services to these children. One notable accomplishment was the establishment of a community-based pediatric healthcare facility in Garden Grove. This 14,000 square foot center provides children's medical, dental, vision and family support services to all kids, not just the Boys and Girls Clubs of Garden Grove. Dr. Miller arranged for interns students from the Southern California College of Optometry at Marshal B. Ketchum University (where she happens to be on the Board of Trustees) to provide the vision care for the children. The College also agreed to give financial support to the cause! You can read more by clicking here. Dr. Miller has served as President of the Board three times and currently also serves as the Board member liaison to Orange, Los Angeles and San Diego counties, as well as Hawaii. Dr. Miller's will continue her role on the Boys and Girls Clubs of Garden Grove Board of Directors, hopefully for another 30 years! Dr. Miller recently passed an extremely difficult test from the American Board of Optometry (ABO). This means she is the first and only optometrist practicing in Garden Grove who is a "Diplomate of the American Board of Optometry!" According to the American Board of Optometry website, an ABO Certified Optometrist demonstrates that she is dedicated to providing quality patient care. "By studying for and passing a rigorous examination, the doctors demonstrate that they have reviewed what they learned in school, kept up with new developments and used these bodies of knowledge to provide high quality patient care." Once again our leader, Dr. Miller has organized and managed Special Children's Day at Garden Grove's Strawberry Festival, and it was a big success! ​Dr. Miller was interviewed by the OC Register and you can watch the video by clicking here.